A deeper look at the grooves pressed into the “White Walker” 12” picture disc by Mastodon. 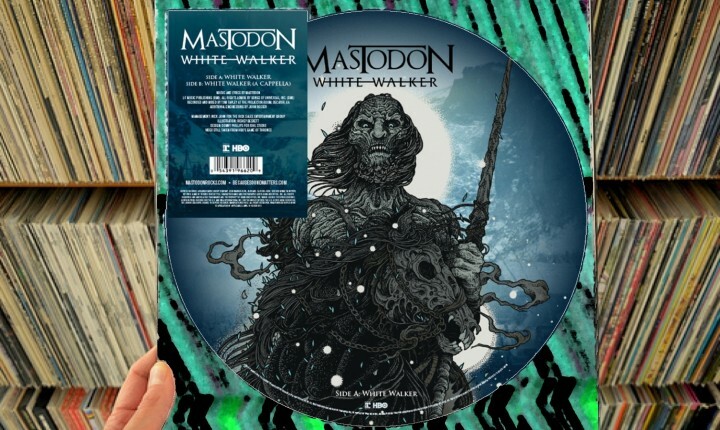 When fans first hear the â€œWhite Walkerâ€ 12” picture disc, the first thought which will pass through their minds (ALL of their minds) will likely be, â€œWow â€“ this doesn’t sound like Mastodon at all.â€ There’s no arguing that; â€œWhite Walkerâ€ has none of the metallic crunch that albums like Leviathan, Crack The Skye or The Hunter had, and it features none of the proto-punk rumbling which began to infiltrate Once More ‘Round The Sun either. There is a gothic pall which looms over this song as well as a Norse flavor within it â€“ but it never lashes out violently as one might expect, it simply gives listeners the impression that it is going to unleash hell for five and a half minutes and then ends. Some fans will say it’s weird. Some critics will be unimpressed. Finally, there will be a small group of listeners who will stand amazed; forget that the song appears prominently in the trailer for the new season of Game Of Thrones, â€œWhite Walkerâ€ represents a giant creative diversion which proves that Mastodon has balls enough to play against the type they’ve been setting for the last fourteen years. opens the song both vocally and instrumentally with a sad but single-minded melody and march, accompanied by little more than an acoustic guitar which both plucks and punctuates stanzas absently. It’s an ominous and unsettling introduction that the band sets, but salacious too because it is a complete brand apart from everything fans know of this band, but it comes through not at all like a novelty; it’s locked down tight and polished in a manner similar to that of all of Mastodon’s music, but certainly not at all the same. As the song progresses, the solemn vocal begins to take on a tone similar to that of a Druid chant (which echoes the dark and cold image that is also presented on the picture disc) which is fresh for Mastodon (not unheard of for metal) which listeners will find hooks them just a little deeper as the song progresses but, as it begins to wind to a close, some electric guitars begin to fade in on a minor key â€“ as if to illustrate that this song was intended to stand alone majestically alone but the band will return to the form fans know before the next full-length album arrives. Even so though, as a song, â€œWhite Walkerâ€ illustrates definitively that Mastodon is capable of producing a greater spectrum of sound than they have previously, and that understated promise is the exciting thing that fans can take away from this single.